And the problem I have is when I do want to indulge in something sweet, the store is full of tons of different sweets - but they are all full of high fructose corn syrup and hydrogentated oils. Not something I really want to put into my body. So when MomFuse asked if I'd like to check out The Kitchen Witch, I was all for it! While The Kitchen Witch products will never be considered a "health" food per se, it's definitely the way to go when you need a little sugar fix. Casey cooks with natural products and never with high fructose corn syrup or hydrogenated vegetable oil. And you won't find any preservatives or artificial nonsense in the goods either. Best of all, they are freshly baked and mailed out right away so you receive them at their peak! 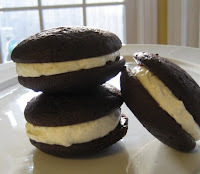 I had the opportunity to try out a couple of the whoopie pies. They didn't last more than 30 seconds after I had opened the box. And you know I love my sister, but I was a tad bummed I opened them when she was here. Because that meant I had to share since there were two! And they were absolutely fabulous! (This photo is from The Kitchen Witch's Esty shop. I devoured mine to quickly to take a photo of them) I really wanted to contact her and tell her I needed a few more in order to truly give them a review! But alas, I just enjoyed the one I had. I was also sent a Heart Shaped Fudge Brownie which I got to enjoy after a long day with a toddler. Somehow life just seems o.k. again after downing a nice yummy brownie! And again, I kinda forgot to take a pic as I sat down to devour it. I did remember before I was finished though! See..... you can kinda tell that's the bottom of a heart! Definitely better than any brownie I've ever made. Last, but definitely not least, were the homemade marshmallows. These were seriously my favorite! It's been so long since I've had any type of marshmallow, because I can't get past the ingredients in the store bought ones, but I was a bit hesitant at first since they were homemade. Let me tell you - these are better than any store bought el cheapo/junk marshmallow!! I cut up one each morning (to make them last that much longer!) and put it on top of my hot cocoa. Absolutely divine. My only problem with them, is that they are now gone! I highly doubt anyone could have anything negative to say about these yummy treats. Not only do they taste great, but they look great too! And (hint, hint!) anything on her site would make a great Valentine's gift! (or birthday gift. or a "it's Friday" gift!) I truly enjoyed reviewing these! She's also going to be offering 10% off to my readers! Once you know what you want to order, send her a message through Etsy and she'll create a custom listing just for you, showing the discount. As an added note - she also has a website other than her Etsy store where she sells ready to bake products. You know, the ones where you buy the frozen dough and make them when you want? Yum! Thanks so much for your lovely review! I have so much fun creating my goodies, it's nice to hear when someone enjoys eating them that much. I look forward to helping your readers satisfy their cravings for wholesome, delicious treats (with, of course, a discount). No one ever asks me to review food :( These sound delicious. I am lovin' those whoopie pies. Going to check them out. My sweet tooth would love to try the Heart Shaped Brownies!! I love this review! I can't wait for her shop to open again so I can browse and purchase. and I love the idea of ready made mixes. so nice!